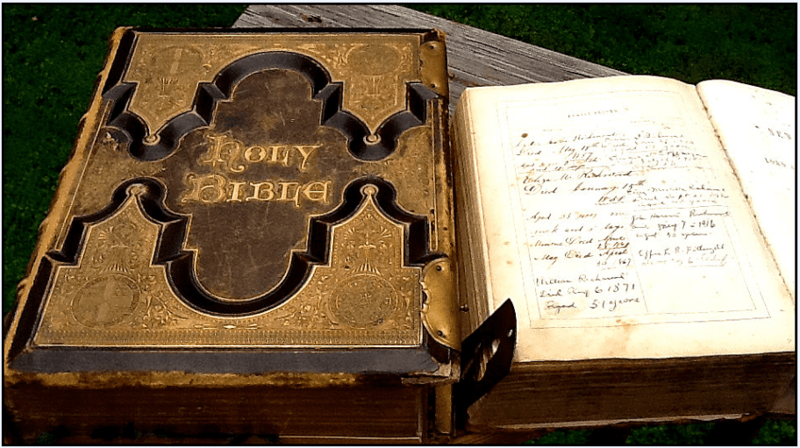 Introduction: In this article, Mary Harrell-Sesniak searches old newspapers to find some interesting stories about family Bibles that were lost – and found. Mary is a genealogist, author and editor with a strong technology background. I recently wrote an article about some exciting genealogy finds, namely, family Bible records that have been quoted in newspapers. (See: Genealogy Tip: Find Family Bible Records Printed in Newspapers.) Most of those newspaper stories have to do with lineage and genealogy, but did you know there is another reason why a family Bible might be written about in a newspaper? Photo: an old family Bible. Credit: Thomas Jay Kemp. It has to do with lost and found Bibles. Here are some examples you may enjoy reading. 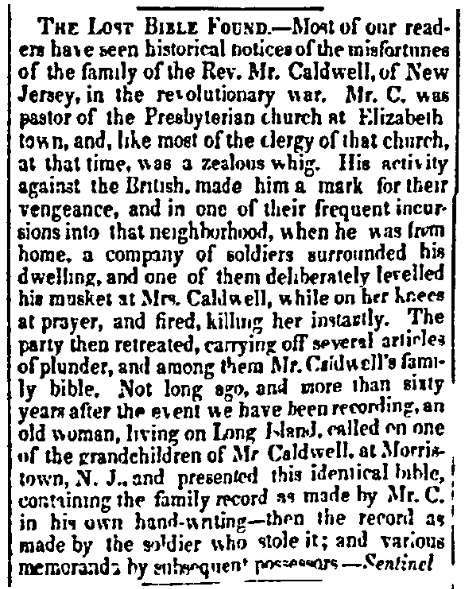 During the Revolutionary War, the family Bible of the Reverend Mr. Caldwell of New Jersey was taken as an act of vengeance by a British soldier. Mrs. Caldwell was at prayer when she found a musket at her head and the Bible she relied on was taken away from her. More than 60 years later, in 1840, it was returned to one of her grandchildren, with an interesting twist: the soldier who stole the Bible had added his own family lineage to it, and subsequent possessors added their own notes! A TV ad in my area reminds potential litigants to keep records and take photos, as records tend to go missing. Apparently, this is nothing new. 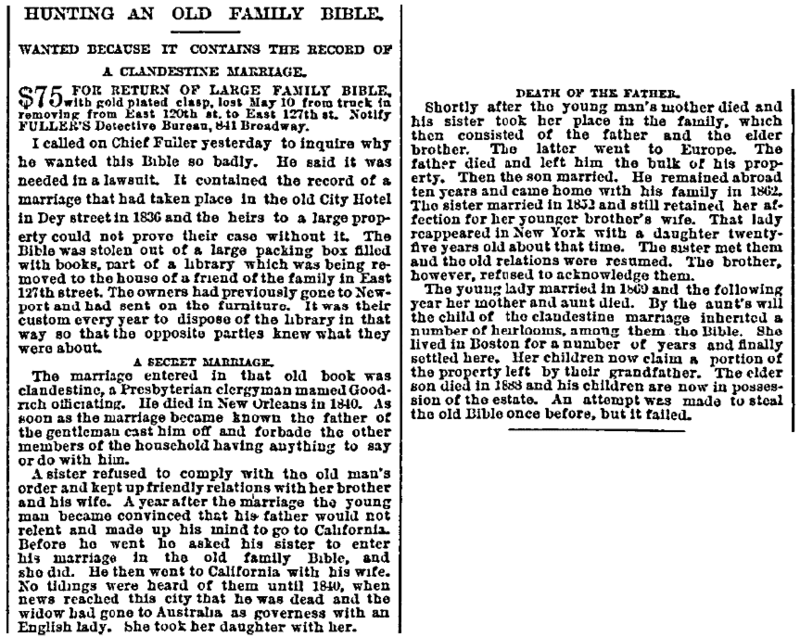 In 1889, a reward of $75 was offered for a missing family Bible in order to prove a clandestine marriage. Without it, the heirs to a large property would miss out on their inheritance. It’s an interesting story, so I’ll leave it to the readers to garner all of the details from the article. 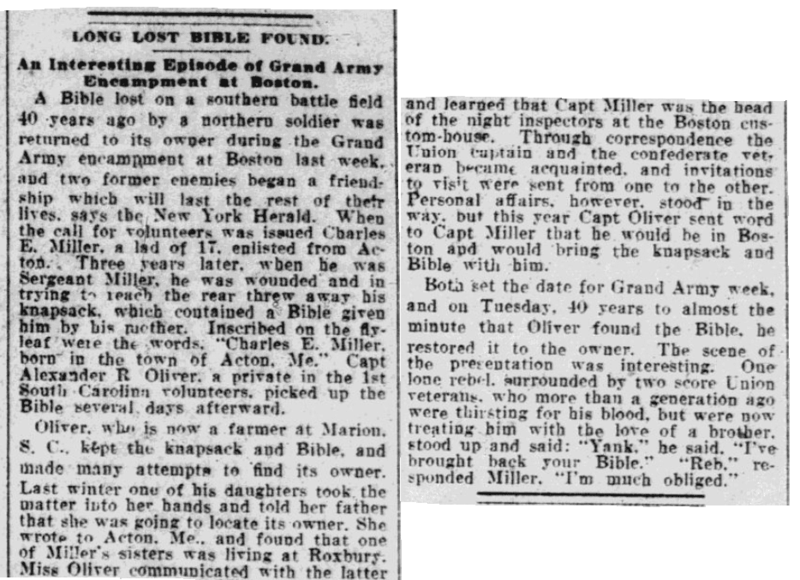 During the Civil War, a Union soldier, Charles E. Miller, became wounded – and while trying to reach the “rear,” he threw away his knapsack which contained a Bible given to him by his brother. The inscription read: “Charles E. Miller, born in the town of Acton, Me.” His knapsack was picked up by a Confederate soldier, Alexander R. Oliver. For many years after the war, Oliver was unable to find the Bible’s owner. Eventually, his daughter wrote to Acton, Maine, and was able to establish communication with Miller’s sister. This last story also has a happy ending, but it took 30 years for a prank to be resolved. 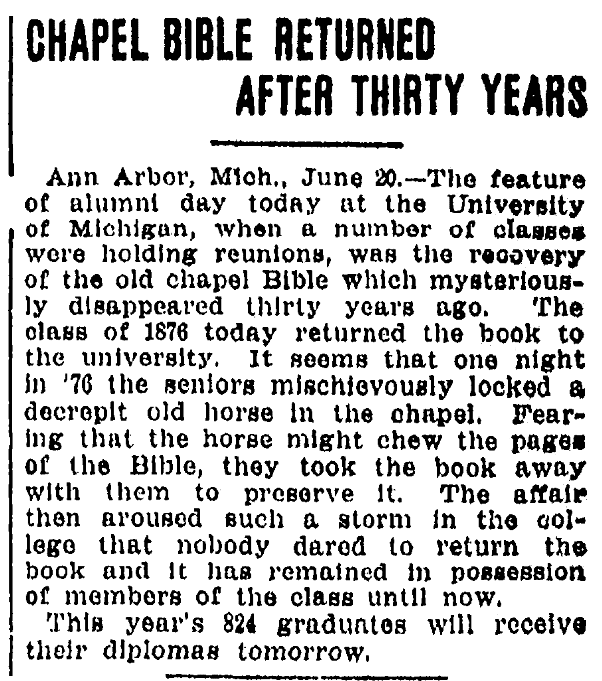 Some seniors at the University of Michigan locked a decrepit old horse in their school chapel. Not wanting the Bible to be damaged, they removed it. However, their prank aroused such a storm that none of the tricksters dared to admit their guilt and return the Bible – that is, until 30 years later when it was finally returned. Thank you for your comment. I recommend you post on social media and also network with other descendants. Don’t forget to check with historical societies in the locations where family and descendants lived. Good luck with your search.